Nothing says “summer” like evenings filled with free, live music in a beautiful outdoor setting. Add yummy picnics with friends and family, then shake it up with dancing on an inviting, green lawn, and you’ve got the makings of an unforgettable summer. That’s exactly what six Levitt venues are serving up across America as they launch their 2013 seasons of 300+ free concerts celebrating community, culture and the arts! It all starts this week with a full slate of all-star performers—including artists new to Levitt stages and returning favorites—plus even more exciting special events and activities, bringing people of all ages and backgrounds together in Levitt cities across the country. 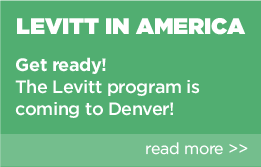 Here’s a sneak peek of what you can expect this summer at Levitt venues across the nation! After a record-shattering 2012 (nearly 109,000 people attended shows! ), Levitt Arlington can’t wait for another summer filled with great music and great fun! The concert season kicks off tomorrow evening, Friday, May 24, with the three-day 2nd Annual Downtown Arlington Center Stage Music Festival. First up is hot alt-country band, Delta Rae, followed by the awe-inspiring Texan psych-pop choir Polyphonic Spree on May 25, whose 22 members dressed in a rainbow of choir robes are a must-see! The season continues with a bevy of returning favorites including experimental rockers Spoonfed Tribe (June 14), contemporary pianist Danny Wright (June 16), folk singer Sara Hickman (June 21), Latin stars Del Castillo (July 5) and Americana artist Radney Foster (July 14). The Children’s Concert Series begins on May 29 with the Emmy Award-winning Biscuit Brothers and continues each Wednesday with African drummers, circus acts, Stomp-style percussion artists and many more performances throughout the season. Believe it or not, 2012 marked Levitt SteelStacks’ first full season with 53 shows that packed in neighbors from all over Pennsylvania’s Lehigh Valley. The summer season, which opened with a special preview weekend on May 17, promises to dazzle audiences given its stellar lineup, including Rock and Roll Hall of Famers The Drifters (“This Magic Moment,” “Under the Boardwalk”) who take the stage on August 17! This weekend, the season gets underway with classic country-rock bands Pure Prairie League and Poco (May 25), and later in the summer, award-winning blues and roots artists The Nighthawks (May 27), the 50s rock-and-roll sound of Bill Haley Jr. & The Comets (June 8), Alice Tan Ridley from America’s Got Talent (July 5), “soul shaking” funk-rockers Flow Tribe (July 20), an urban spin on classic New Orleans brass from Stooges Brass Band (August 22), and salsa favorite Hector Rosado y su Orchestra (Sept 1). Long before it had a Levitt Pavilion, MacArthur Park in Los Angeles already had achieved legendary status in the music world with the hit song “MacArthur Park,” written by Jimmy Webb and recorded by Richard Harris and Donna Summer. In celebration of the 45th anniversary of the song’s release, Levitt L.A. is kicking off its 2013 season on June 15 with Jimmy Webb himself, who will be performing “MacArthur Park” in the park, along with some very special guests. It will be an evening full of surprises, and you won’t want to miss it! And the surprises don’t stop there! Fantastic musical acts continue all summer long, including: the orchestral cabaret act Vaud and the Villains (June 22), rising bluegrass meets hip-hop stars Gangstagrass (July 11), West African funk rockers Yemen Blues (July 14), punk marching band Mucca Pazza (July 20), global hip-hop group Nomadic Massive (August 1), international reggae sensation Rocky Dawuni returns for a KCRW Summer Nights performance (August 24), and Pink Floyd Dark Side of the Moon (August 25), a classical quartet offers their rendition of one of the most acclaimed albums of all time. Plus—families get ready!—starting on June 16, Levitt L.A. will present its popular Children’s Concert Series, occurring every Sunday. Audiences said they wanted a longer spring season, and Levitt Shell obliged! 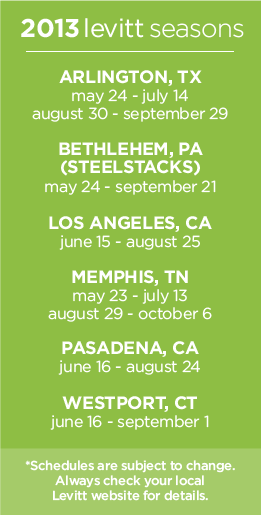 Beginning tonight, Levitt Memphis is presenting an expanded eight-week spring season, followed by its regular fall season, which begins on August 29. Fun, funk and festivals—that’s what audiences can expect this year at the Levitt Shell. Stepping onto the historic Overton Park stage are dozens of spectacular artists including: funk bassist George Porter, Jr. (June 13), country singer/songwriter Ray Wylie Hubbard (June 20), alt-country artist Son Volt (June 27), and blues guitarist Sonny Landreth (July 5). Plus, it’s the return of a Memphis favorite, Todd Snider’s What the Folk? Festival on June 15 with a new roster of amazing performers! And to wrap up the spring season, the Levitt Shell will present a special 40th anniversary celebration of The Recording Academy’s Memphis Chapter (July 13). Grab your picnic blankets, Pasadena! This summer, the Levitt lineup in Memorial Park is better than ever with dozens of world-renowned artists and a slate of crowd-pleasing, community-building activities—all starting on June 16. The 2013 season will heat up Levitt Pasadena with sensational performers, including GRAMMY® Award-winning bluegrass/Americana legend Jim Lauderdale (June 21), Latin soul singer Alex Cuba (June 22), traditional Italian ensemble Canzoniere Grecanico Salentino (June 29), neo-soul/Native American singer Martha Redbone (July 7), reggae rock meets Delta blues artist Vieux Farka Touré (July 12), hot new bluegrass “folk tornado” Whiskey Shivers (August 8), and GRAMMY-winning Latin funk band Quetzal (August 24). Also back by popular demand is the Luckman Sidestage, a pre-concert community stage programmed with a variety of special performances and activities. Local artists can share their talents on Open Mic Sundays. Other evenings feature local DJs, Zumba and dance classes, yoga workshops, and more! Plus, beginning June 19, Levitt Pasadena kicks off its weekly Wednesday kids programming, starting with celebrated L.A. favorite, the Bob Baker Marionettes. The night comes alive in Connecticut this summer as the original Levitt Pavilion for the Performing Arts (Levitt Westport) celebrates four decades of music and entertainment under the stars! Audiences can expect an exciting season of first-class performers, as always, and this year they’ll be enjoying them on Jesup Green. Why? Because this season will be fully produced off-site as construction of the all-new state-of-the-art Levitt Pavilion gets underway in the coming weeks. The season opens with the ever reggae-tastic Mystic Bowie on June 16. Then, free concerts continue all summer long with acclaimed and award-winning artists including: progressive Americana rockers The Grand Slambovians (July 5), Brooklyn-based electro-pop band Hank & Cupcakes (July 12), “gypsy swingin’ circus freaks” Caravan of Thieves (August 3), pop standard vocal group Emil Stucchio & the Classics (August 4), and GRAMMY Award-winner Vince Giordano & the Nighthawks (August 18). Plus, the annual RiverSwing Series—now in its 10th year—makes its return, featuring free pre-concert dance lessons in the style of that evening’s music, including tango with Cuartetango (June 27) and bhangra with DJ Rekha (July 27). And of course, every Wednesday night Levitt Westport presents its Children’s Series, which will welcome back beloved kids folk-rock group Bari Koral Family Rock Band (August 21). This entry was posted in Concerts, News, The Levitt Effect on May 22, 2013 by Melissa Smith.